There’s no place in today’s job-seeking world for stagnancy. Accepted job search and resume protocols that were standard 20, 10 or even just a few years ago are changing dramatically. If you’ve been employed for some time, and are just now jumping back in the job search pool, it’s the perfect time for a refresh. My colleague, Master Resume Writer Dawn Bugni, addresses this perfectly in an article on her blog titled “How current is that job search advice? 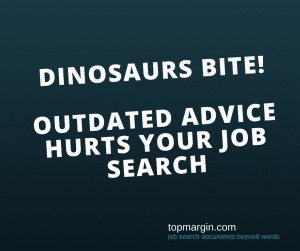 Responding to the dinosaurs.” After receiving 1990’s-era job search advice regarding a cutting-edge resume written for a client, Dawn took the stops to dissect why many old-school methods don’t work. And shows, by example, fresh new techniques that help applicants stand out from the crowd without sacrificing professionalism or credibility. I highly recommend checking out Dawn’s article. Her message is right on point: In today’s job search market cookie-cutter doesn’t cut it. Differentiation is the key. Don’t be afraid to do something because it’s never been done that way before. Ready for a refresh? Check out our resume services here, we’ll make sure your resume doesn’t go the way of the dinosaurs.